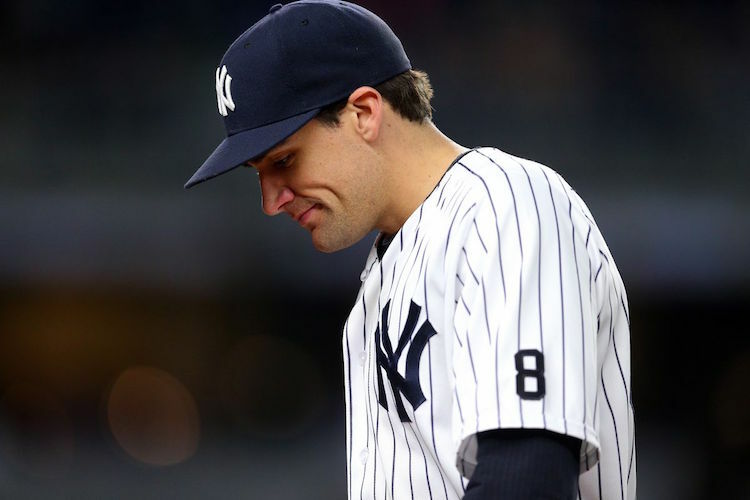 I think people forget how much Nathan Eovaldi sucked as a Yankee. Yes, Eovaldi had an impressive 23-11 record in two seasons, 51 starts and three relief appearances for the Yankees, but that win-loss record is very deceiving. In 2015, Eovaldi received 5.75 runs of support per start, and only 10 of his 27 starts were “quality”. In 2016, it was much of the same, as he received 5.54 runs of support per start, and only eight of his 24 starts were “quality”. As a Yankee, Eovaldi pitched to a 4.45 ERA and 1.387 WHIP and only struck out 218 in 279 innings (despite throwing 100 mph), but somehow posted a .676 winning percentage. He was as average as average can be, and anything other than the “Nasty Nate” nickname the Yankees gave him on social media. With an arm like his, there’s a reason why the Dodgers and Marlins gave up on him, allowing him to become a Yankee: because he isn’t good. If missing nearly two years and then having a few good starts against the worst teams in the majors can completely erase the rest of your career, then every mediocre starter should sit out for a couple years. The perception of Eovaldi as a starting pitcher has changed so much because of 48 1/3 post-Tommy John surgery innings that a lot of people are willing to completely disregard his other 739 career innings. Since his return on May 30, Eovaldi no-hit the A’s for six innings, one-hit the Nationals in six innings, allowed two earned runs over six innings to the Marlins, and on Sunday, he one-hit the Mets over seven innings (and carried a perfect game into the seventh in that performance against the Mets). Supposedly, the Yankees had a scout at Eovaldi’s dominant outing at Citi Field, so naturally some Yankees fans want a reunion with Eovaldi because he has been unhittable against two of the worst two teams in baseball, an underachieving disaster and a respectable .500 team. Unfortunately, the Yankees don’t need another start can shut down teams counting down the days until the end of the season. They need a starting pitcher who can beat other playoff-bound teams. A starting pitcher who can win in the postseason. Eovaldi is far from that. In his other four starts, Eovaldi was his usual self, needing nearly 100 pitches and sometimes more to get through five innings. In three of those starts, he faced the Yankees, Mariners and Astros, all of which will be in the postseason. His line in those games: 18.1 IP, 19 H, 12 R, 12 ER, 1 BB, 13 K, 7 HR, 5.89 ERA, 1.093 WHIP. That’s the real Eovaldi, and I’m going to pass on the guy who gave up seven home runs in three games to actual Major League hitters. I think the Yankees will too. On Saturday, the Yankees faced J.A. Happ, another name the team has been connected to because of his expiring contract and because of his success against the Red Sox. Like Cole Hamels’ start earlier this season against the Yankees, Happ had a chance to show that he can handle a real lineup in a pressure situation. The pressure in this situation being the Yankees needing to win every game to keep pace with the Red Sox and Happ needing to pitch well in an audition to join a contender. Happ’s audition didn’t last long. The Blue Jays’ left-hander gave up back-to-back home runs to lead off the game and then walked the next two batters. After back-to-back strikeouts, he gave up a two-run double, and the Yankees had a 4-0 lead. Happ needed 34 pitches to get through the first inning. In the second inning, he loaded the bases with two walks and a single before bouncing back to get out of the jam unscathed. But in the the third, after a leadoff walk, a lineout, a strikeout and another walk, he was removed. Jake Petricka came in and further ruined Happ’s day and ERA by giving up a two-run triple on his second pitch. Happ’s line: 2.2 IP, 4 H, 6 R, 6 ER, 6 BB, 5 K, 2 HR. I know Happ is better than that. I have seen him be better than that. But he’s 35 now and has a 4.44 ERA and unless he gets traded to a postseason team, he won’t pitch in a bigger game in 2018, and he was awful. Yes, one start is the smallest of sample sizes, but the postseason is all about small sample sizes, and the Yankees can’t afford to add the wrong starter for the final two months of the season and the postseason. He’s still a better option that Eovaldi. Domingo German has been the answer to Jordan Montgomery’s rotation spot, but his inconsistency might end that, and Jonathan Loaisiga looked he might be the answer to Masahiro Tanaka’s before suffering shoulder inflammation. I don’t think Luis Cessa is the new answer to that spot, and I don’t trust him to be either. That would leave Justus Sheffield as the next starting option. I’m all for Sheffield being given a real chance to be part of the rotation, but with the way the Yankees have babied their starting prospects over the years, I know I can’t count on that idea (even if has the ability the biggest difference-maker the Yankees could potentially add). I definitely don’t want Eovaldi to a Yankee again since I didn’t want him to be one for the first time. I also don’t want Happ or another rental pitcher like him to be one if the price is anything other than a couple prospects that are nowhere near the majors and most likely will never reach them either. A trade for Jacob deGrom isn’t happening and I don’t think I want to give up current Yankees and more Major League-ready prospects for someone who could be done every time he throws a pitch. The same goes for Madison Bumgarner. But even if I did want either, they are both most likely unavailable. The Yankees’ best bet is either Happ or Cole Hamels, who I petitioned for earlier this season. Either will be a salary dump and the return would be players without a spot on the Yankees prospects nowhere near helping the Yankees. Either will be better than Sonny Gray (who’s the reason the Yankees need to add another starter), and will be more reliable and stable than Luis Cessa or their other in-house options. Outside of the Gray trade last year, rarely, if ever, has someone been connected to the Yankees and they eventually trade for them. Usually, out of nowhere, the Yankees are reported to be close to acquiring a player, and five minutes later, a deal is done. Neither Happ or Hamels has been connected to the Yankees of late. One of them needs to be their guy, and they should go out and get one of them.